McKesson Pink Nitrile Exam Glove are non-sterile powder free gloves. 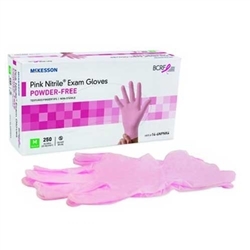 Nitrile exam gloves provide a latex free glove with improved conformability provides superior fit and extended wear comfort. The Color Pink® and Pink Nitrile® are used under license from the registered trademark owner Colur World, LLC.